Mythos is the “other” game in development by Flagship Studios, aside from the soon to be released Hellgate London. 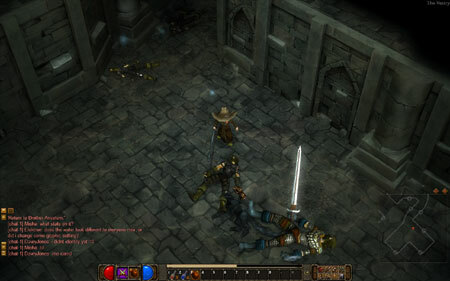 Mythos is a fantasy dungeon crawler similar to Diablo and NCSoft’s Dungeon Runners. Unlike Dungeon Runners, which doesnt take itself too seriously and pokes fun at the genre, Mythos is a bit more serious take on the action RPG genre. BTW I’m also giving away 5 Beta Invites to Mythos. Let me know if you’re interested. beta invite sent =) link me up. thanks! Would really like to join the beta aswell… thank u in advance! mythos down for patch update. will try later. I’m posting on the off chance that you still have a spare Mythos beta invite as I’d desperately like to play. Thanks a bunch. Hey I don’t know if it’s too late but if you could get me in it would be greatly appreciated. I’m a big Diablo fan. I would be really happy if you had a spare invite for me! been trying to get in for some time now to get in as i loved D2 and some of the other similair titles. I see the date of the last message and i hope now u have some other beta invite ? So if someone have one, i will be very happy, because i’m waiting for this game a long time ago and i miss the official beta invite :( . please send me 1 invyt i really want to play dis game… ive been waiting for this… please please please!!! thank you kind sir! I can’t find any game I would like.